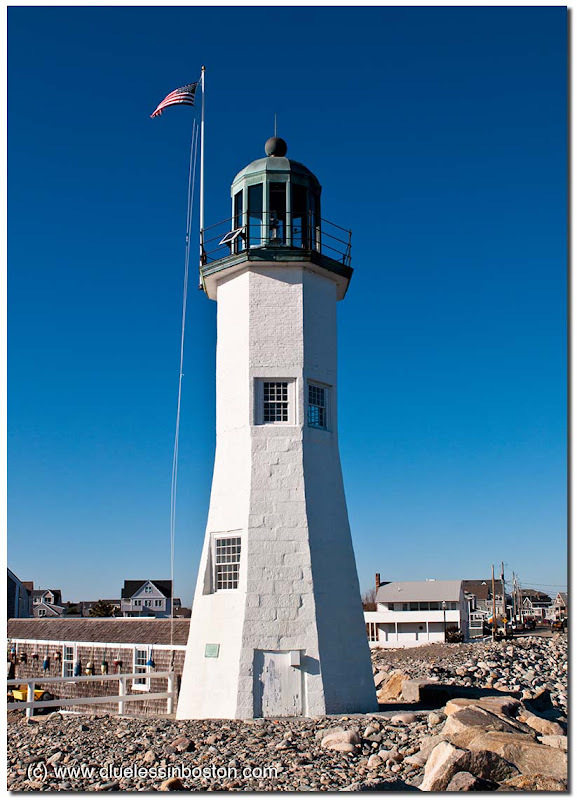 Minot Scituate Light in Scituate. Wonderful shot! Really gorgeous light. "Minot" in french slang means "kid", and by extension, everything small.This lighthouse is a kind of baby Lighthouse! :o), surely located in a wonderful place with great view, as lighthouses often are.. Wonderful shape - and a gorgeous graduated blue sky. Exciting places to visit... beaches in winter. I have never visited a lighthouse, it's a dream for me!Thanks for sharing so beautiful picture! I live on an island, I have to love lighthouses, especially against such a gorgeous blue sky. Stark white stone light house centered on a rocky embankment against a cloudless blue sky - very spare, very clean, very nice. Oh wow. I love everything about this shot! The varying colours of the blue sky, the flag, the broken rocks at the base of the lighthouse and, of course, the lighthouse itself.